In collaboration with DET CRC and industry, the GSSA undertook a regional drill program along the southern Gawler Ranges to improve understanding of the geology and mineral potential. Results from the drill program and surface geological mapping and data collection provided an integrated approach to geological survey mapping. The Mineral Systems Drill Program saw the use of DET CRC technology during a regional drill program that enabled real-time geochemical, mineralogical and petrophysical data collection. The availability of multiple streams of data to inform near real-time decision making throughout the program provided a look at the potential future of drilling. The program played an important part in testing and developing DET CRC technology through to commercialisation, including the innovative new coiled tubing drill rig RoXplorer ®. During the formation of mineral deposits from hydrothermal systems, geochemical and mineralogical alteration of the host rocks is often extensive. The GSSA are developing methods for recognising and characterising key features of an alteration system through the integration of spectral, petrophysical and geochemical datasets. Our investigations involve drill core sampling and analysis, geochemical and spectral data interpretation, 3D mapping and modelling. Systematic acquisition of spectral data on drill core with the HyLoggerTM is being used to map mineral variation around key mineral systems in the eastern Gawler. The mineralogy from spectra analysis is being integrated with other datasets to provide greater understanding of alteration and changing chemical environments within the mineral system, including the world-class Olympic Dam deposit. Interpreted solid, or basement geology maps are a fundamental exploration dataset in regions of sedimentary cover, where exploration risk is high due to uncertainty in the geology beneath. The Eastern Gawler Craton is an area that has been the target of significant data acquisition in recent years, and has been incorporated into a revised solid geology map. The area covered by this revised interpretation includes the Olympic Domain, a known copper-gold province, as well as a large region of the central Gawler Craton. The interpretation is for use at ~1:500 000 scale, and combines outcrop geology, drillholes and new interpretation of magnetic and gravity data. 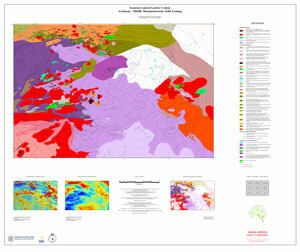 The solid geology map and spatial data is intended to represent crystalline basement stratigraphy, which is considered to be older than middle Mesoproterozoic in this region. Targeted dating of mineral systems across the Eastern Gawler will support the development of models for the setting and formation of key lithostratigraphic units and mineral deposits through the application of isotope geochronology and related isotopic geological methods. Principal methods used are SHRIMP and LA-ICPMS geochronology, together with Lu-Hf, Sm-Nd and other isotope decay systems.